Nice work! That’s a mighty fine-looking windsock your family made today. And what’s that? 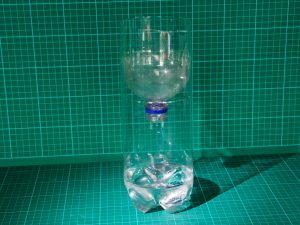 A cloud in a bottle? Very cool. What’s really going on in there? Your bottle is mostly filled with air, but you also put in a little warm water and some smoke, from the match you dropped inside. The water has created some water vapour (that’s water in the form of a gas), mixed with the air in the bottle. When you squeeze the bottle, the air is compressed (forced into a smaller space), which also causes it to get just a little bit warmer. When you let go, the water vapour and air mixture expand back to their original volume. That cools them down, and some of the water condenses – which makes it forms tiny droplets – on the smoke particles. That’s what you see as your cloud. Clouds in the sky don’t form because somebody was squeezing the atmosphere and let go, but the rest of what’s happening is quite similar. Changes in pressure cause water to stay as a gas, or to condense into droplets. When droplets occur close to each other, we see a cloud. If you like clouds, proudly call yourself a nephologist (a cloud scientist). You might like the BBC’s excellent cloud spotting guide to find out more. This is a nice activity that will help you to measure rainfall in your backyard. It’s easy to make. 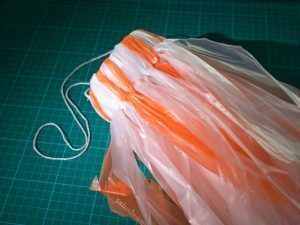 You’ll need a pair of scissors, a 2 litre plastic bottle, a measuring jug, and a permanent marker pen. 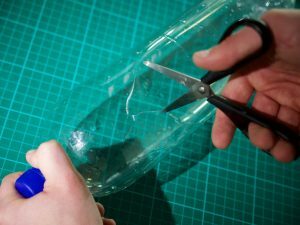 Take a clear 2 litre plastic bottle and carefully cut off the top to make a funnel. Turn your new funnel upside-down, then place it into the remaining part of the bottle. 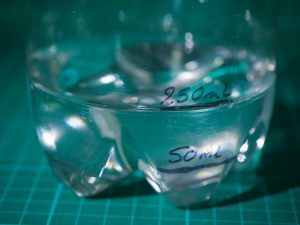 Fill a measuring jug with 50ml of water. Keep going until you get bored. Now you’ve made your rain gauge, pop it out in your garden or back yard and wait for the rain – you’ll be able to measure the mount of rainfall each day and compare it with the day before!